I find that the times right after a vacation are the times when life gets the busiest. Which is the main reason why it always takes me so long to write a blog about our adventures. Our Disney vacation was, in one word, MAGICAL. Months of planing really paid off, guaranteeing that our experience was wonderful in every way. I will recount day by day what we did and what it cost us. So let us jump in! We live in Florida, so we only had a 3 hour drive to get to Disney World, nonetheless we woke up early and were loaded up and on the road by 9 am. I had several little presents wrapped for our daughter which doubled as birthday presents and kept her entertained on the drive. Every half hour or so I gave her a “Tinkerbell Present” such as a Disney themed golden book, or a play set from the Disney store, or the wooden magnetic princess dress up. Since I planned in advance I was able to wait for all of these to go on sale and ended up paying less. We made it to the Contemporary Resort at noon. Check-in was a breeze and the cast member was extremely helpful and nice. She made sure we all had celebration buttons (which are free) and she made sure we understood the dining plan and everything else. If you have any questions at all that is the time to ask, they are more than happy to help you and will go out of their way to insure you are happy, Disney has some of the best customer service in the world, so make sure to use it! Our room was great. Very spacious, elegant, and well appointed. We were in a corner unit and had a patio. The pool and volleyball area were right in front of us and the lake was to the right. I wanted to set up an in-room celebration for our birthday girl, but I didn’t want to shell out the $350+ it would cost to have Disney Floral and Gifts do it (I am not going to lie, I considered it, but in the end decided I would rather spend that money in the park). So that meant DIY time! While my husband took our daughter to check out the pool and the concourse my sister and I rushed to our room and set up our own celebration. We laid out all of her presents on the beds, and decorated the room with Disney princesses, streamers, and confetti. Brand new Mickey, Minnie, and Donald plushies sat next to the presents which included an Elsa dress, a Cinderella wand, a Frozen jewelry set, an Elsa doll, a Frozen play set castle, Minnie ears, and frozen comfy slippers. I bought all of these items from the Disney store, I waited for all of them to go on sale (read: I checked the Disney store’s sale page every day starting in October) which made me be able to get the Elsa dress for $26, which is an AMAZING price for such a good quality, authentic dress. Our little one was ecstatic, she was so happy she didn’t know what to open first. We explored the grounds for a bit before heading to our room and changing into our swimsuits. The pools were great. They are heated, have a slide, a sprinkler area, and splash zones in the main pool. There is a bar which serves food and drinks, and lots of reclining chairs, and cabanas. No, the Contemporary’s pool is not as themed as other hotel’s but I felt like it had enough to be fun for the kids and relaxing for the adults, I though it was just perfect. Also there are SEVERAL lifeguards on duties and they all take their job VERY seriously, which adds another level of safety. Once pool time was over we took showers and got ready for our dinner at Chef Mickey’s. We had Advanced Reservations (ADR) for all the restaurants we ate at (you have to if you want to be able to get in) but this does not mean that you will be seated immediately, there will still be a wait. We waited about 15 minutes, time that we spent taking pictures and watching cartoons. Please note we purchased a Disney Dining Plan as part of our package, therefore we did not have to pay any extra for our dinner. The buffet itself was good, but the highlight of the evening was meeting Mickey, Minnie, Pluto, Goofy, and Donald. Out of all of them I have to say that Goofy was the nicest and most energetic. He was not rushed and he wanted to play with everyone on the table. Seriously kudos to that cast member he went above and beyond. 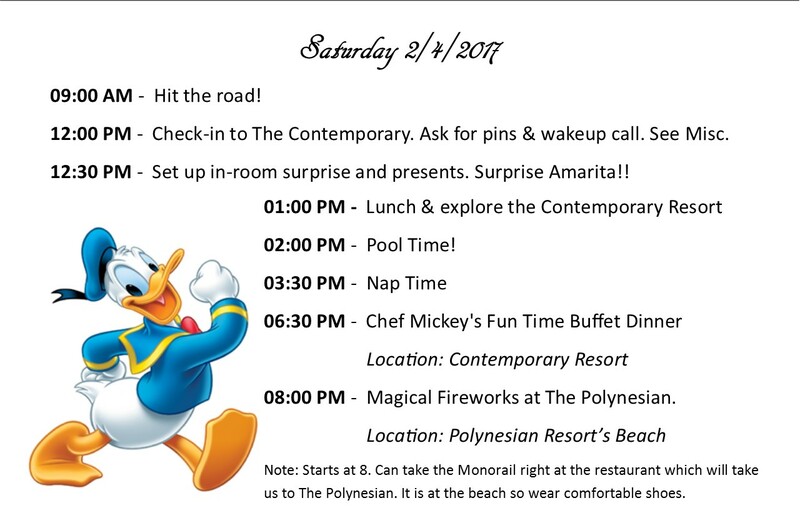 In my original plan for that evening we were going to go to the Polynesian resort after dinner to watch the fireworks from the beach. But dinner ran long (meeting all of those characters and taking pictures takes time) so we had to cancel. This is one of the most important things you can do when you go out on vacation, ADAPT. Adaptability is one of the main skills needed in order to have a happy vacation. So while I wanted to go to the beach, it actually worked out better not to go, between it being cold, we being late, and planing on waking up very early the next day it might have been stressful to haul our large party over there. Instead we watched the fireworks from right outside our room. Which was an added bonus, you have a good view of the fireworks from pretty much anywhere in the Contemporary since you are walking distance from the park. After the fireworks we were tucking in when we heard very loud music coming from the outside, but after a quick glance we could not determine the source (we figured it out the next night, purely by accident). And that was it for our first vacation day!